Enrique Iglesias is a Spanish-born singer, songwriter, actor, record producer, and cartoonist. His father, Julio Iglesias (Julio José de la Cueva Iglesias), is a Spanish singer, with Spanish and Galician Spanish ancestry. His mother, Isabel Preysler (Maria Isabel Arrastia Preysler), is a Filipino journalist, socialite, and television host. Isabel’s ancestry is Spanish and Filipino (Kapampangan), with possible, distant, Austrian roots. Enrique has two children with his partner, Russian tennis player and model Anna Kournikova. 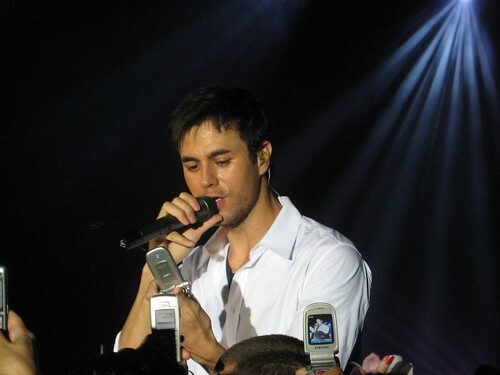 Enrique has written songs in both Spanish and English. Enrique’s father has stated that he has, or that he thinks he has, some degree of Sephardi Jewish ancestry on his own mother’s (Enrique’s paternal grandmother’s) side. It is not clear if this ancestry has been documented/verified. Julio’s recent ancestors were not Jewish. Enrique’s paternal grandfather was Julio Iglesias Puga (the son of Ulpiano Iglesias Sarriá and Manuela Puga Noguerol). Julio was born in Ourense, Province of Ourense, Galicia, Spain, and was a prominent gynecologist. Ulpiano was the son of Juan Iglesias and Carmen Sarria. Manuela was the daughter of Elías Puga de la Torre and Elisa Noguerol Buján. Enrique’s paternal grandmother was María del Rosario de la Cueva y de Perignat (the daughter of José de la Cueva y de Orejuela and Dolores Perignat y Ruiz de Benavides). José was the son of Manuel de la Cueva y Campo Redondo and Rosario de Orejuela y Prieto. Enrique’s great-grandmother Dolores was evidently born in Guayama, Puerto Rico. She was the daughter of José Mariano Eleuterio Gavino de la Santísima Trinidad Perinat y Ochoa, a Spanish military officer, from Seville, Seville, and of Manuela Ruiz de Benavides y Pérez. Enrique’s great-great-grandfather José was of part French ancestry, from Paris. Enrique’s maternal grandfather was Carlos Pérez de Tagle Preysler (the son of Don Fausto Preysler y Moreno and María Carmen Pérez de Tagle Pastor). Fausto was the son of Don Joaquín Preysler/Preisler Cernuda and Doña Natalia Moreno Ravelo, who were from Cádiz, Cádiz, Andalusia, Spain. Enrique’s great-grandmother María Carmen was born in Dumaguete, Negros Oriental, Central Visayas, the daughter of Don Benito Pérez de Tagle y Mijares and Doña Carmen Pastor Teves. Enrique’s maternal grandmother was María Beatriz Arrastia y Reynares (the daughter of José Salgado Arrastia and Teodorica Reinares). María was born in Lubao, Pampanga, Central Luzon, Philippines. José was the son of Don Valentín Arrastia Roncal, who was born in Allo, Navarra, Spain, and of Francisca Serrano Salgado. Enrique’s maternal great-grandfather, José Salgado Arrastia, was also a paternal great-grandfather of American actor Steven R. McQueen, making Enrique and Steven half-second cousins. he is not Jewish on his fathers side ? He looks soo Austrian to me. Enrique doesn’t have Asian eyes, and his dark skin comes from tanning.